A History Book Club main selection. “Kaplan has produced a full-length narrative of this remarkable life, rendered in lucid and loving prose. . . . Kaplan rightly portrays Adams as a man ahead of his time. . . . A valuable book about an important American figure.” Robert W. Merry, New York Times Sunday Book Review. "There is much to praise in this extensively researched book, which is certainly one of the finest biographies of a sadly underrated man.... His accounts of a world before the transportation and communication revolutions of the mid-19th century, his rich descriptions of European culture seen through the eyes of a young American, his astute analysis and deft explication of complicated political and diplomatic issues before the Civil War — these are the marks of a master historian and biographer." Carol Berkin, The Washington Post. 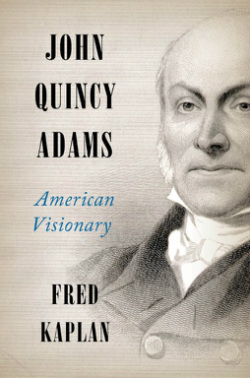 "In John Quincy Adams: American Visionary, Fred Kaplan presents a well-written, comprehensive and highly satisfying account of Adams' personal life and career as we have in print." Alec Rogers, Washington Times. "In undertaking John Quincy Adams, Fred Kaplan, distinguished professor emeritus of English at Queens College and the Graduate Center of the City University of New York, clearly is trying to do for the son what David McCullough did for the father. He may have achieved that goal.... It was a notable life, marked now by a notable biography." David M. Shribman. Boston Globe. "Where have you gone, John Quincy Adams? ... Fred Kaplan's biography of the sixth US president should be required reading inside the Beltway.... Kaplan’s narrative is both riveting and brimming with telling details." David Holahan, Christian Science Monitor. "Admiring and admirable." Robert K. Landers, The Wall Street Journal. In this elegant study, Kaplan (Emeritus, English/Queens Coll. ; Lincoln: The Biography of a Writer, 2008, etc.) portrays our sixth president as a deeply literary man, devout husband, orator, diplomat and teacher who had grand plans for the country’s future, including the building of national infrastructure and the abolition of slavery. A lofty work that may propel readers back to Quincy Adams’ own ardent writings. A failed president is the popular conception of the sixth chief executive of the U.S., but Kaplan’s open mind as he diligently researched this much-maligned figure and conceived the biographical picture he would construct based on his wide reading and study results in a much broader understanding. With great felicity of style, Kaplan, who is not only an esteemed biographer (his Thomas Carlyle, written in 1993, was a finalist for two top prizes) but also a professor of English, pays respect to his academic background by following as a major thread in this monumental biography Adams’ giftedness as a writer, as his many public writings and copiously kept diary attest. An outstanding diplomat prior to his occupancy of the White House, Adams, son of the second president, stumbled badly in the highest office in the land. But Kaplan sees not an inadequate man in a position he could not manage. He sees instead a “visionary,” who stood for a united American republic free of the divisiveness of slavery. The lack of accomplishments during Adams’ one-term presidency was the result, as Kaplan depicts it, of his enemies’ concerted and united effort to thwart any of the programs he endeavored to achieve. Barnes and Noble click here. John Quincy Adams is a president about whom most Americans know very little. In comparative rankings he inhabits the netherworld of the list, not quite as dismissed as James Buchanan and Franklin Pierce but not even in the ranks of Grant, Madison, Monroe, and Polk, and nowhere near the upper tier of Truman and McKinley, let alone the pantheon of Washington, Jefferson, the two Roosevelts, and Lincoln. Was Adams indeed a failed one-term president hardly worth deliberating about today? That is far from the story this book tells. The totality of his life, including his presidency, is a significant tale about accomplishment and failures. It is a story not only about our sixth president's America but about America now. His values, his definition of leadership, and his vision for the nation's future – particularly the difficulty of transforming vision into reality in a country which often appears ungovernable – is as much about twenty-first century America as about Adams' life and times. Like Lincoln, Adams, with sharp intellect and scholarly brilliance, was a gifted writer in personal and in public prose. He was also a capable poet. Every word that he spoke or published on matters of public policy he wrote himself. "Literature has been the charm of my life," he wrote in1820, "and could I have carved out my own fortunes, to literature would my whole life have been devoted. I have been a lawyer for bread, and a Statesman at the call of my Country." His poems are often graceful, witty, immediate, and engaging in the 18th-century sense; some are lightly occasional, others autobiographical. Gifted with a caustic strain, he also wrote satiric poetry with a bite, and his religious and patriotic poetry engaged his deepest feelings. As he studied languages, he translated Greek, Latin, German, and French writers. He wrote essays on literary as well as political topics, particularly Shakespeare's plays. His book-length history of weights and measurements, on the face of it a dry subject, is an example of a government report turned almost into a masterpiece by its philosophic overview and cogent style. His 1833 "Report of the Minority of the Committee On Manufactures" and his argument in 1841 before the Supreme Court in the Amistad case are brilliantly written public documents on public policy and human rights . From his earliest years, Adams detested slavery: he was one of only two anti-slavery presidents between the founding of the country and the election of Lincoln. Like Lincoln thirty years later, Adams despised the populism, states' rights, and pro-slavery policies of his successor, Andrew Jackson. The Whig party, which came into existence in 1834 and lasted until 1856, and with which Adams became affiliated, was Lincoln’s until 1856. The policies that it advocated and those of the new Republican Party of 1860 were those of Adams' presidency: strong central government; federally supported infrastructure policies; and effective but not expansive executive power. Like Lincoln, Adams believed that the Constitution was a living document; the western territories belonged to the entire American people; taxing and being taxed were essential to responsible self-government; the country required a modern, national, and regulated banking system; slavery was an abomination that needed to be contained and ultimately eliminated; Native Americans deserved to be respected and brought into the American community; and the federal government had an important role to play regarding the "general welfare" in the creation of educational, scientific, and artistic institutions, such as the Smithsonian Museum, the national parks, the service academies, and land grant universities. The weakness of Adams' presidency resulted from the determination of his political opponents not to allow him any public policy achievements. With divided government, they had the power to do that. The pro-slavery and land-hungry South and West had good reason to believe that Adams had strong abolitionist sympathies and favored a higher price for government land in order to fund federal projects. In 1828, Jackson defeated Adams' bid for re-election. He brought to the office a rush of executive authoritarianism, intemperate demagoguery, the spoils system under the guise of "reform," harsh racism, strong support for slavery, and anti-intellectual ignorance. Without the constitutional provision that for every five slaves three units be added to the total number of white people to be represented in a congressional district, the popular and electoral college results of the 1824 and the 1828 elections would have had a different appearance: Adams would have been elected in 1824 by popular vote rather than by the House of Representatives, and the1828 election would have been closer and far from the landslide that it has been misrepresented as having been. Adams became the only ex-president to serve in Congress, where he served for sixteen years, emerging to public notoriety as the most outspoken opponent of slavery and of the Southern stranglehold on the American government in high public office. All his life he feared the dissolution of the Union. Slavery would destroy it, unless some future president would use the war powers inherent in the Constitution to end slavery. There would be rivers of blood. He both dreaded and hoped for the Civil War. From his adolescence until his last days, Adams kept a diary: his most varied, brilliantly observed writing achievement, a record of political activities and personalities, theatrical performances and religious reflections; of his reading, his thoughts, and his meditations. That achievement, like all his writing on public subjects, was enlightened by a vision of an America that would move confidently into its destiny, a national union in which individual liberty harmoniously co-existed with federal programs that promoted economic, social, scientific, and cultural progress. It was also deeply personal, a living organism, containing his account of the objective world and his inner life. Much of what went on in his imagination and his heart embodied the dynamic interaction between his reading and what he wrote in his diary. The unpublished original reveals a man of deep feeling. In conjunction with his private letters, it provides us with a moving self-portrait of a loving husband married to an estimable woman; of an engaged father who suffered the misfortune of the deaths of three of his four children; of a son who carried the blessing and burden of his parents' belief in his high destiny; and of a man engaged throughout his life in searching for the right balance between emotion, religious belief, and rational analysis. . In February 1830, Adams wrote a letter which includes a piece of powerful writing that resonates with his own life, with the intensity of his diary, and with the ironies and tragedies of American history. That is not the case with Adams' story. There is a great deal of pain and gloom. But there is also success and brightness.